경주시 노서동에 있는 금관총에서 발견된 신라의 금관으로, 높이 44.4㎝, 머리띠 지름 19㎝이다. 금관은 내관(內冠)과 외관(外冠)으로 구성되어 있는데, 이 금관은 바깥에 쓰는 관으로 신라금관의 전형적인 형태를 갖추었다. 즉, 원형의 머리띠 정면에 3단으로 ‘출(出)’자 모양의 장식 3개를 두고, 뒤쪽 좌우에 2개의 사슴뿔모양 장식이 세워져 있다. 머리띠와 ‘출(出)’자 장식 주위에는 점선문을 장식하였고, 많은 비취색 옥과 구슬모양의 장식들이 규칙적으로 금실에 매달려 있다. 양 끝에는 가는 고리에 금으로 된 사슬이 늘어진 두 줄의 장식이 있는데, 일정한 간격으로 나뭇잎 모양의 장식과, 줄 끝에는 비취색 옥이 달려 있다. 이 같은 외관(外冠)에 대하여 내관으로 생각되는 관모(冠帽)가 관(棺) 밖에서 발견되었다. 관모는 얇은 금판을 오려서 만든 세모꼴 모자로 위에 두 갈래로 된 긴 새날개 모양 장식을 꽂아 놓았다. 새날개 모양을 관모의 장식으로 꽂은 것은 삼국시대 사람들의 신앙을 반영한 것으로 샤머니즘과 관계가 있을 것으로 생각된다. 이 금관은 기본 형태나 기술적인 면에서 볼 때 신라 금관 양식을 대표할 만한 걸작품이라 할 수 있다. The Gold Crown and Diadem Ornaments were excavated at an ancient Silla tomb now called Geumgwanchong (“Gold Crown Tomb”) in today’s Noseo-dong, Gyeongju. 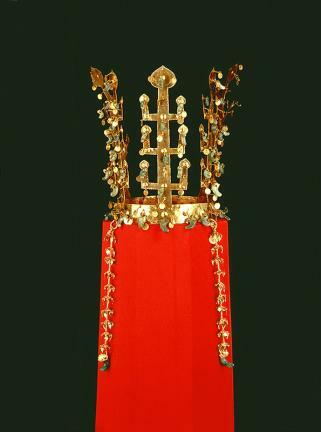 The main item, the gold crown, has height of 44.4 centimeters and headband diameter of 19 centimeters, displaying the typical features of Silla crowns characterized by three tree-shaped ornaments erected from the front part of the base band and a pair of antler-shaped ornaments on the rear part. The base band and the erect ornaments are decorated with many dots and hung with jade drops and gold leaves. The crown also has a pair of gold strings draped down and decorated with gold foliage clusters arranged at regular intervals and a jade drop at each end. 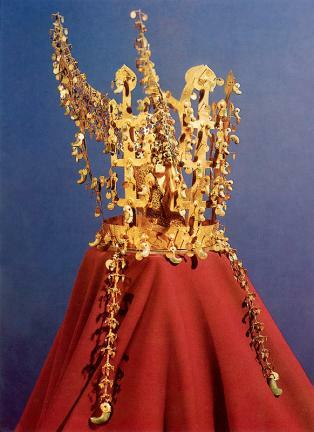 The crown was discovered along with an inner cap made of several pieces of thin gold plates decorated with several different geometrical patterns and an ornament shaped like a pair of open wings. Art historians believe that the decoration of the crown with the wing motif is connected with Shamanism, which was widespread during the three early Korean kingdoms (57BC-668). With its fine form and excellent workmanship, the crown is generally regarded as the greatest among all the Silla crowns discovered so far.